Boukan Guinguette is in Mole Saint Nicolas' bay. Sailors will find here a real marine haven, one of the safest in Haiti. This mooring was by the way the first where Christopher Columbus landed in Hispaniola on 6th of december 1492. Buccaneers and european merchant ships used to drop anchor here. American and French governments attempted to annex Mole many times during the 19th and 20th centuries but they always failed. Mole was considered as the best marine strategic platform in the Great Antilles. Today, a lot of projects speculate on the devlopment of the peninsula which protects the entrance of the bay. The vessels will moore without difficulty on available buoys. First needs supplies are available on location. Time of buccaneers is out. Be quiet, Mole marine authorities eradicated modern piracy!! Travelers will have to pay a daily fee to use the mooring. This participating fee enters in the budget that the town council mobilizes to make community projects turn a reality. 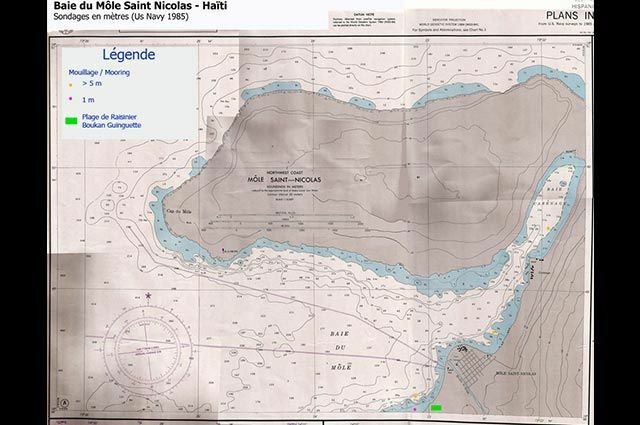 All customs formalities to enter in Haiti can be done in Mole Saint Nicolas directly with the police or the town council authorities.